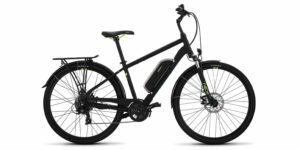 The Junto Gen 1 is a tough, urban inspired electric bike with some design concepts and component choices I’m most accustomed to seeing on mountain bikes. Take the higher volume 29er tires that normally come with cross country style trail models vs. narrow 700c (roughly 28″) tires that most road and city models use, or the fatter tapered head tube and rigid thru-axle on the front end, the suspension-corrected geometry that makes swapping out the rigid fork for a 100 mm travel suspension fork a very relevant option. 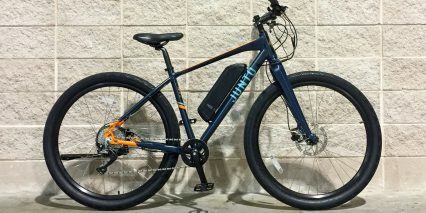 This is a completely custom, purpose-built electric bike with a sealed headset and bottom bracket, durable salt-resistant display panel, dynamic torque sensor, and zippy geared hub motor. 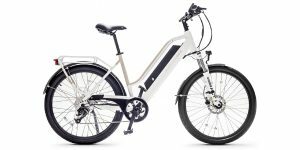 And even though the company was only selling this one model at the time of my review, it’s being made in three sizes and two color schemes and comes with a comprehensive 2+ year warranty. 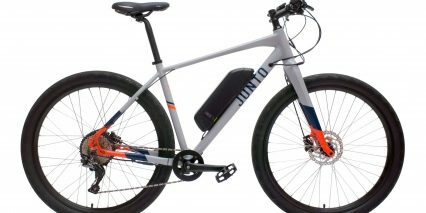 It’s the kind of product that starts to sink in and demonstrate attention to detail when you look closely and have an expert on hand… I met with a lead product manager named Sam Ebert who works closely with the lead engineer from Junto to get the inside scoop and some technical answers for this review. He has a background in mountain bike racing and blended cycling passion with historical references and technical insights during our conversation, which made it fun. 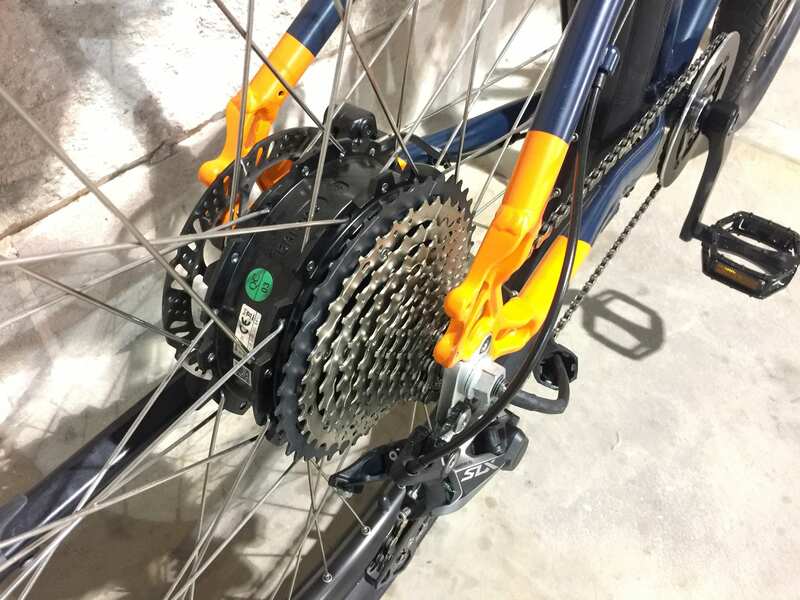 Some of the stand-out features that I noticed during our talk and ride test were the responsive bottom bracket integrated torque sensor, wider rims paired with thicker rear spokes and reinforcement eyelets, and wider 150 mm rear hub spacing to accommodate a full 11-speed drivetrain. 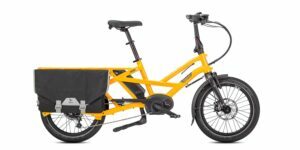 This is a more active electric bike that feels like an extension of your legs vs. a scooter that does the work for you. 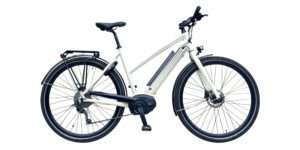 It offers Class 1 pedal assist with a 20 mph top assisted speed making it legal in more places and helping it achieve better range than a lot of comparable products. It’s simple in some ways but also very durable and extensible with fender and rack mounting points. 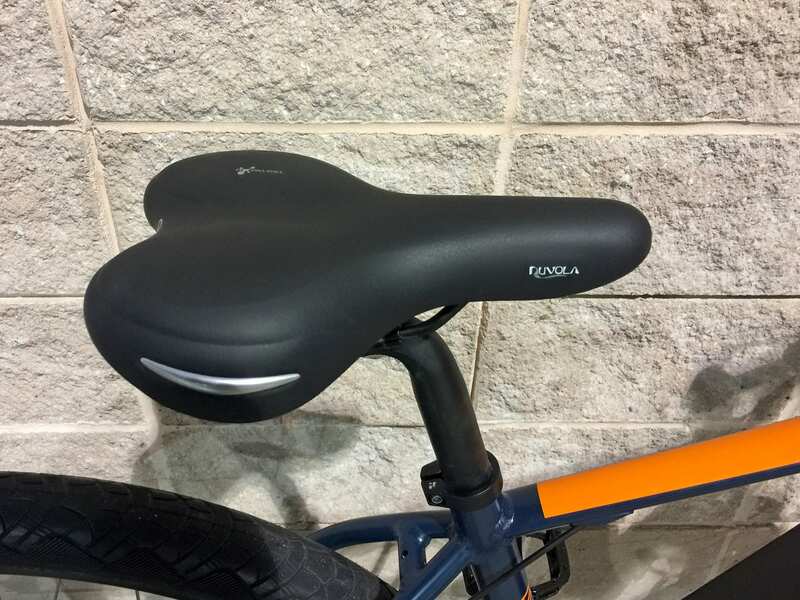 Although, you will need to pay a bit extra for a special seat post collar with eyelets for mounting most aftermarket rear racks. 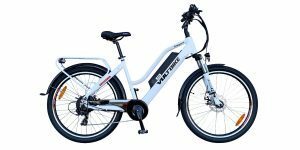 Driving the bike is a compact 350 watt nominally rated geared hub motor from Bafang. I was told that it peaks around 500 watts and produces up to 60 Newton meters of torque, and that they chose this motor vs. a higher powered option because of how zippy it feels along with the lower weight and “very legal” status. 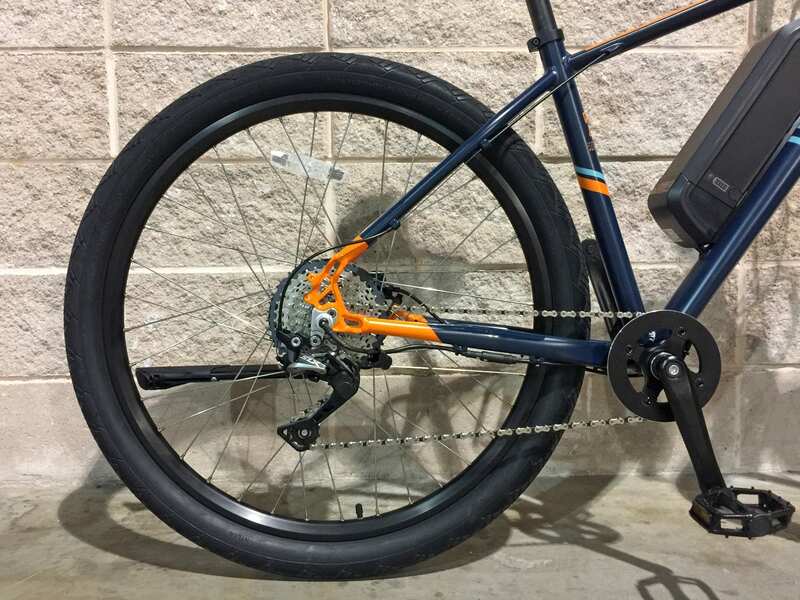 Bafang is one of the biggest electric bike drive system producers in the world and this 350 watt hub motor is one of the most common widely-used parts I have seen and used over the past several years. It’s proven, it’s reliable, and it can still be lots of fun to use compared with 500 or even 750 watt motors because of the way it’s tuned here. 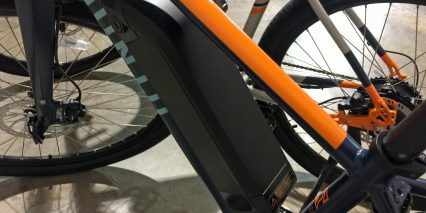 Junto went for torque vs. speed and since you have to pedal in order to activate it with the torque sensor, it makes you feel strong and in control when you ride, especially in the higher levels of assist. 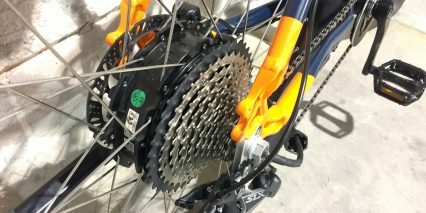 This motor pairs perfectly with the 11-speed Shimano SLX drivetrain and does not create excessive mashing or drivetrain wear the way that a mid-drive motor might. It’s a completely separate system, but I should call out the upgraded corrosion-resistant chain that Junto is using here. 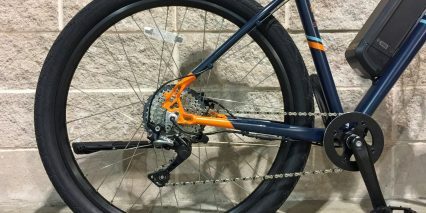 That chain is somewhat protected by an alloy chainring guard and it can be tightened by using the one-way Shadow Plus derailleur clutch. 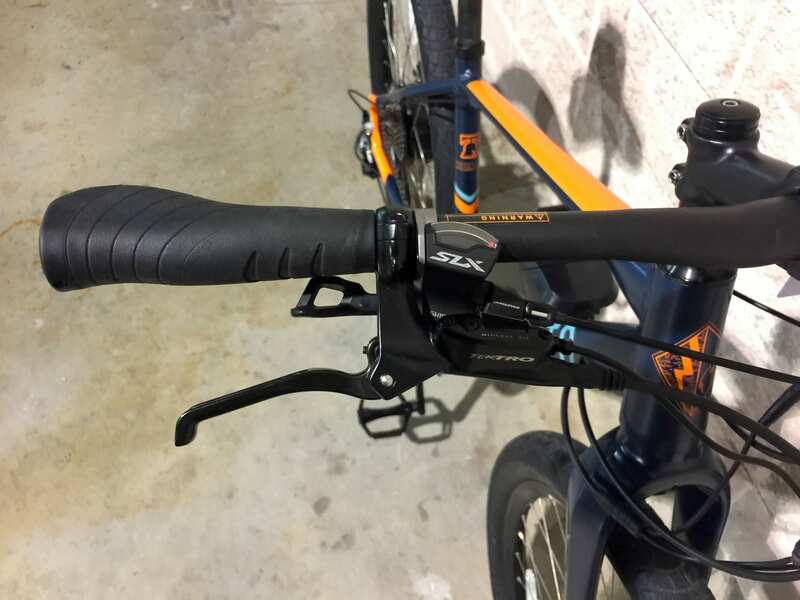 I point to it in the video review above, but this little grey lever can be pushed towards the front of the bike or up, the up position tightens the chain for reduced slap and slipping in bumpy or high-speed riding conditions. 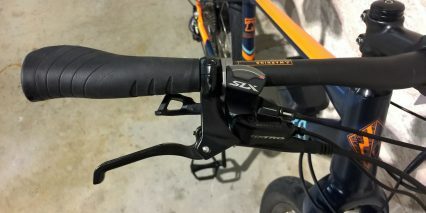 The trigger shifters that control the derailleur are also upgraded SLX level which allows for multi-shift when going to lower gears and two-way action when going to higher gears. They are tucked away nicely near the right grip and keep the cockpit clean and high-performing. 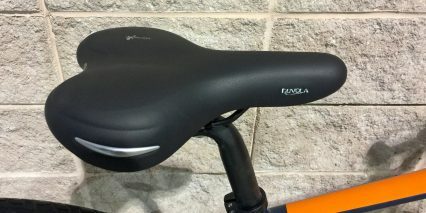 I love the ergonomic Velo locking grips and Selle Royal Nuvola gel saddle that strike a balance between comfort and efficiency. The grips won’t spin and the saddle won’t chaff but also won’t make your seat bones sore. 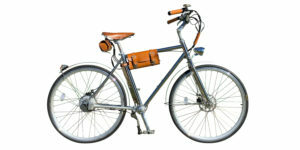 Powering this electric bicycle is a downtube-mounted plastic battery box with 48 volt 11.6 amp hour capacity. It’s slightly above average in terms of energy storage as well as throughput. 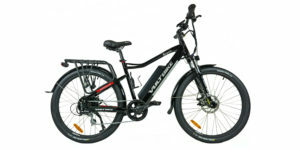 The 48 volt configuration sends electricity more efficiently than 36 volt and is capable of higher Amp delivery which is part of what makes the motor so zippy. 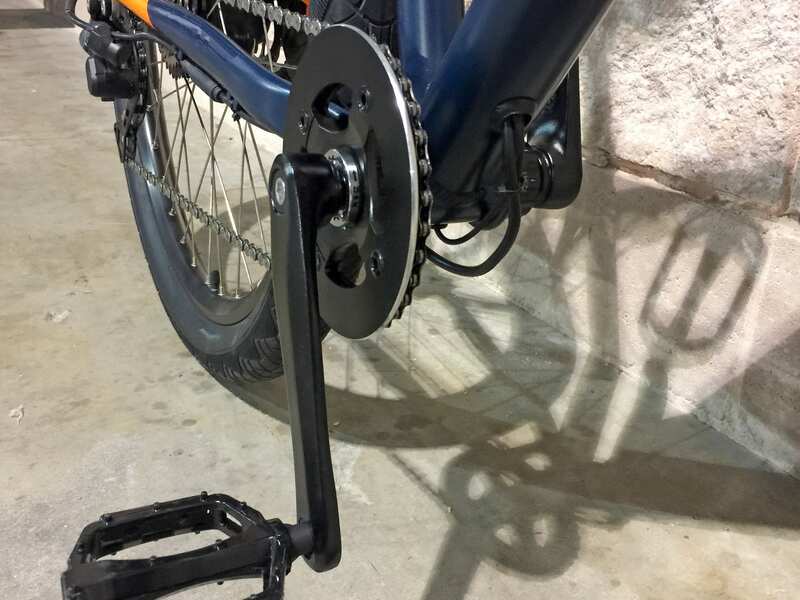 I appreciate how and where they mounted the pack, low and center on the bike frame, and that the battery tips out from the side vs. up when being removed because that allows the top tube on the smallest frame size to be much lower, decreasing stand over height. Remember, this thing is running 29-inch wheels which raise the frame up. 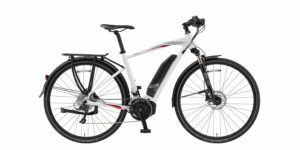 Junto does not offer a mid-step or step-thru model and I think that speaks to the sporty emphasis of this bike. 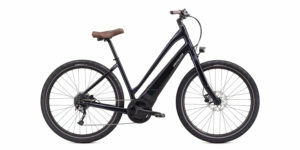 It’s going to be stiffer, easier to lift, and lighter weight with the high-step triangular frame. And, weighing in at ~49 lbs total, you can quickly remove both the 6 lb battery and ~3 lb front wheel to make lifting and transporting easier. 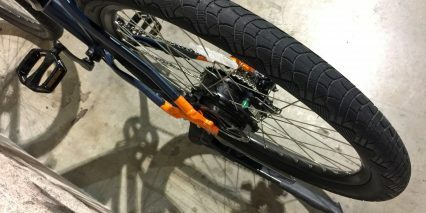 The front wheel uses a quick release Maxle style thru-axle and the battery locks and unlocks with a secure keyed core. 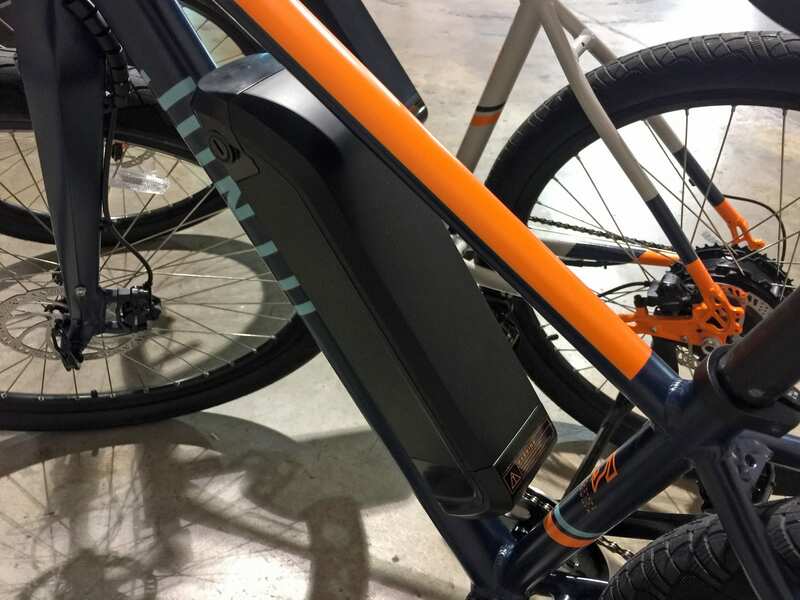 For people who cannot bring the bike inside for safe storage, it’s great to be able to take the battery off and fill it inside using the standard 2 Amp charger. 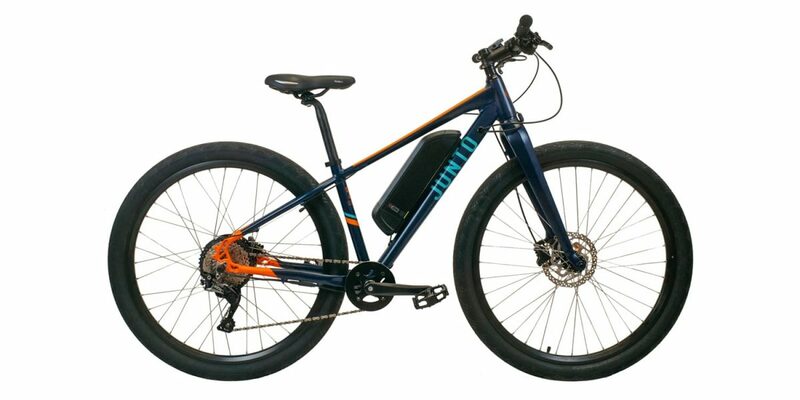 I was unable to show that during the review but was told that it weighs about 1.5 lbs and I’m guessing it’s similar in size to many of the other chargers I see on Bafang powered electric bikes, like the Evelo Quest One (click back once on the image viewer to see the charger there). Operating the Junto Gen 1 is super simple… once the battery is charged and locked onto the frame, just hold the power button on the black control pad located near the left grip. 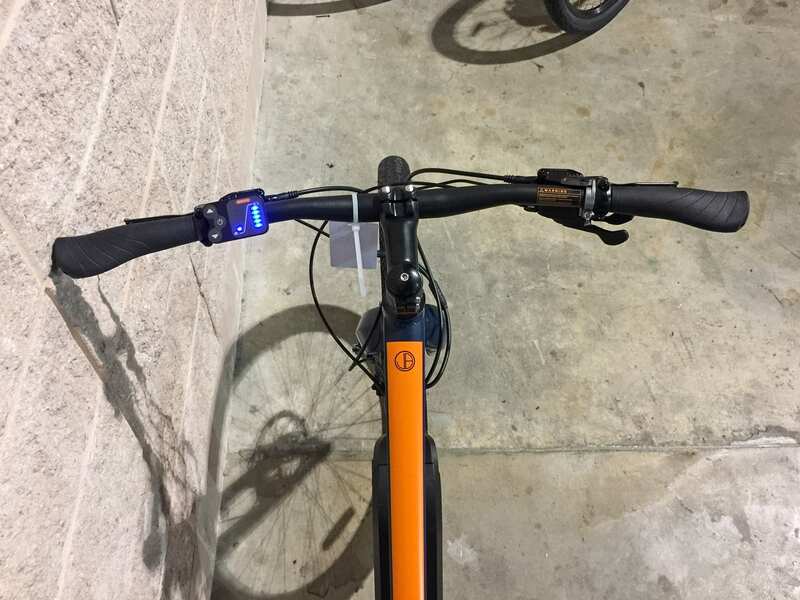 This button pad is very simple, but probably generates less attention and is going to be more durable than the fancy LCD screens on a lot of the more expensive bikes. 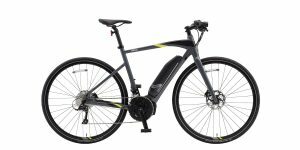 I guess this ebike isn’t the most affordable at $2,222, but considering the components, it’s not too bad. The display is one area where they went cheap, and you won’t be able to tell how fast or far you’re going or estimate range, set a timer, or see your odometer here… just the most important features remain. You get a simple 5-bar battery readout and a 1-5 level assist chart which can also go to zero if you arrow down. Zero mode isn’t very useful here because there’s no display or lights to run, and there aren’t any USB charging ports or other fancy apps to play with. Simple. Reaching the button pad is easy to do without removing your left hand, so that makes riding feel safe, and Sam told me that this particular display has a high salt spray rating. Considering that Junto is based in Philadelphia, where they frequently salt the roads, this is a great attribute! 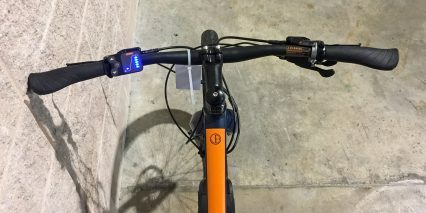 One gripe I have about both the battery charge level indicator and the display readouts is that they use bright blue LED lights that can be distracting in low-light and nighttime riding conditions. I would probably use some masking tape to dull these lights if I bought this product for myself. And, I would probably get the medium sized frame as a 5’9″ tall person (I got to test all three sizes). 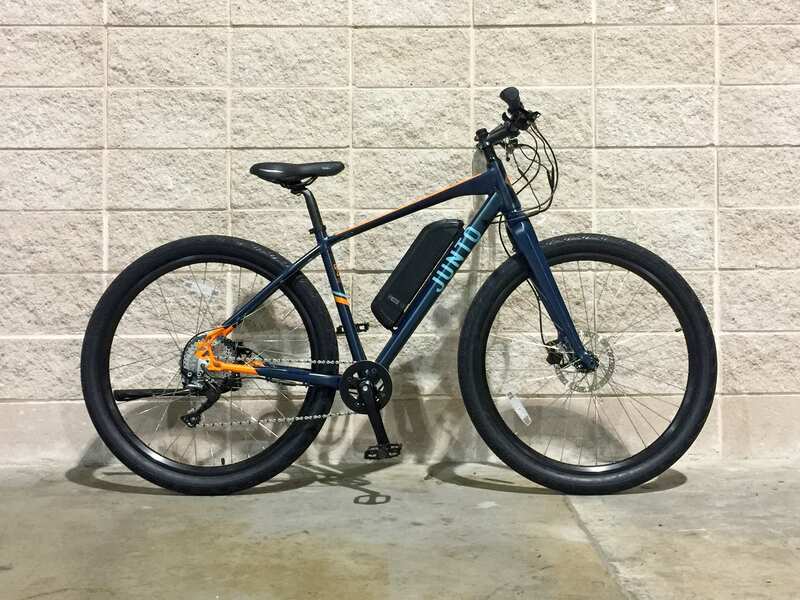 Unique 29″ x 2.3″ tire size is fast, stable, and comfortable due to the increased air volume and lower attack angle, it’s a fun bike to ride in urban environments! Interesting bike but sadly it’s limited to 20mph assist. 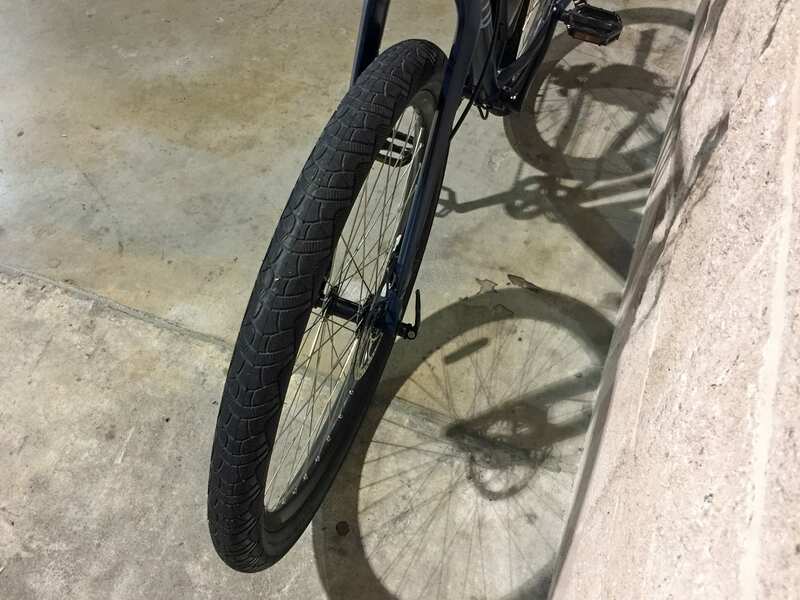 I do agree that for urban commuting the wide large tires make great sense – precise and fast performance and the ride quality in reality can be better than a front only or even a full suspension with the right tire pressure. I think a lot of industry marketing $s have gone towards convincing riders they need suspension bikes even for urban riding but I suggest that people test and experiment because I simply have not found that to be true (I have full rigid, front fork hardtail, and full suspension eBikes and really enjoy riding the full rigid bike the most as it’s more nimble and the ride quality on the 2″ Kenda Kwicks is surprisingly nice. 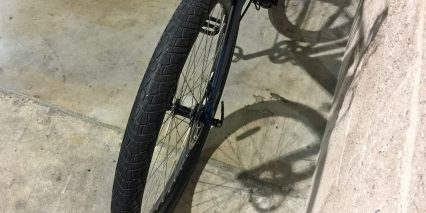 Does anyone have information on these tires as I could not find them on CST website. Thanks for the feedback! 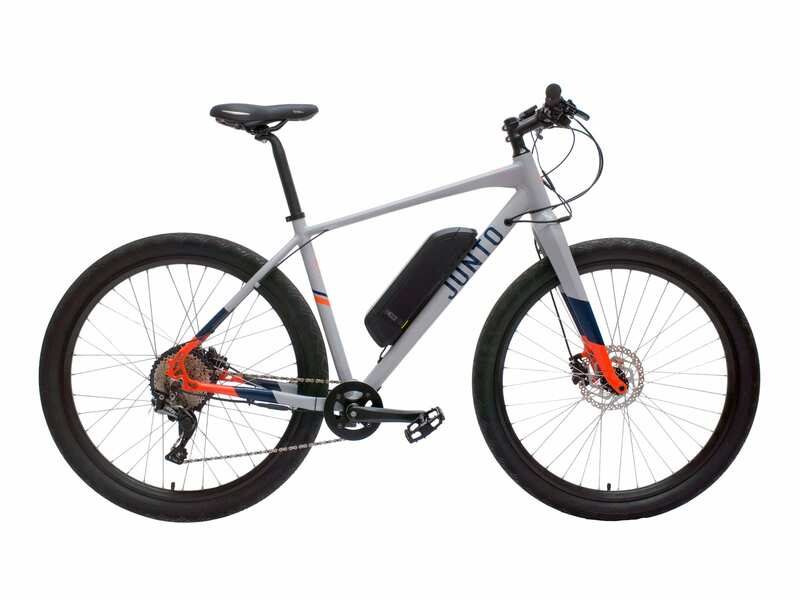 We do have plans for a class 3 E-bike, and limiting the above model to a class 1 allowed us to deliver excellent torque throughout its speed range. 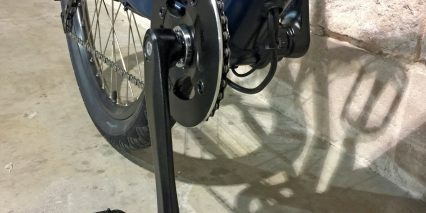 We agree that there is a particular bias when it comes to suspension and there is still a world of set-ups to be explored by riders and bike companies alike. We use 29″ x 2.35″ (28″ x 2.35″) CST C1635 tires on this model, which can be found on CST’s website here. 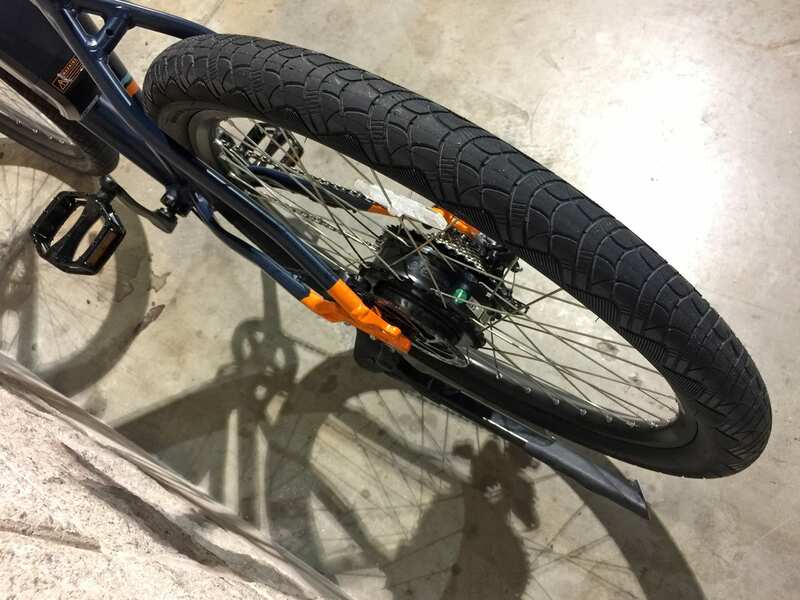 We find their rolling speed, traction, thickness, and volume to be ideal for urban riding- and a wider inner width rim certainly adds to the experience. We haven’t had a flat yet over thousands of miles of testing!